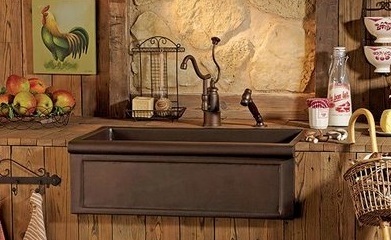 Copper sinks and tubs are works of art for your kitchen or bathroom! 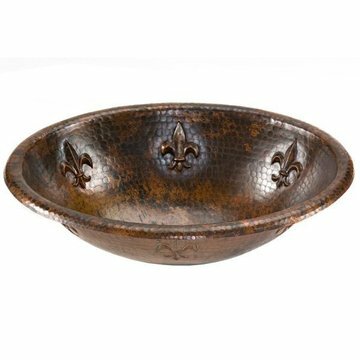 Van Dyke’s copper sinks are handcrafted from a single sheet of the highest quality copper, then hand-hammered by highly skilled artisans, resulting in a durable and beautiful sink that will last for generations. 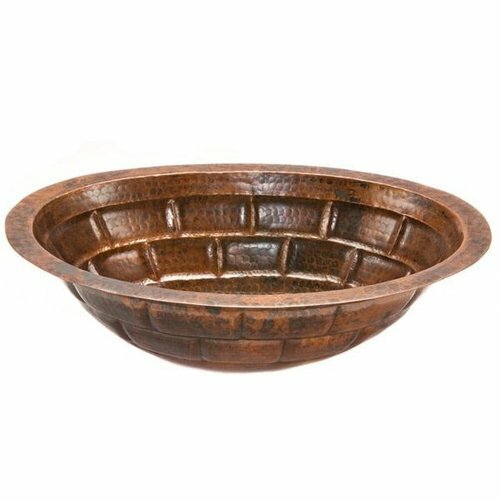 Van Dykes carries one of the widest varieties and styles of copper sinks available including drop-in, undermount, split 50/50, split 60/40, split 75/25, apron, and vessel. 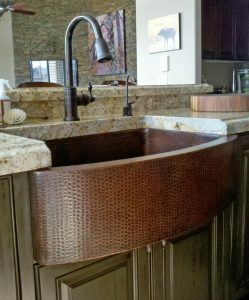 We have several unique styles of copper sin ks including the whimsical Miner’s Pan, round, rectangular, 12-inch champagne sink, and many types of kitchen and bar prep sinks. 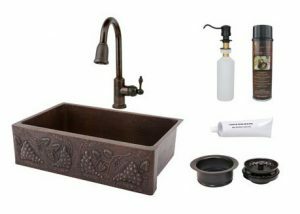 These gorgeous sinks come with many pretty design patternss including fleur-de-lis, braided rope pattern, brick pattern, feathered, sunburst, grape, and star design. 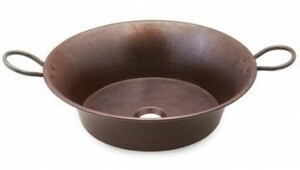 Copper sinks add a beautiful warm luster to your c ounter top and over time, will produce a unique patina. Numerous studies show that the life span of certain bacteria is significantly shorter on copper than on nearly any other surface. Copper is also a good conductor of heat so your dishwater stays warm longer. Copper goes with most any design scheme. Another major advantage of copper is it is 100 percent recyclable and can be melted down and reused. 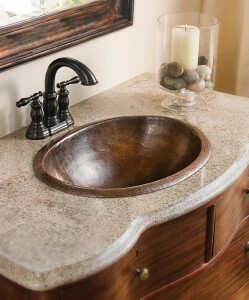 When choosing a copper sink, look for one that is made from recycled copper. Also choose one that is thick. The lower the gauge of the copper, the higher the quality of the sink. 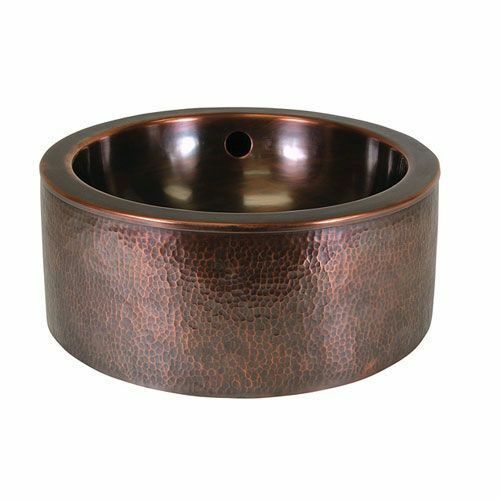 Higher gauge copper results in a lighter sink that is easily dented and has a tinny sound. 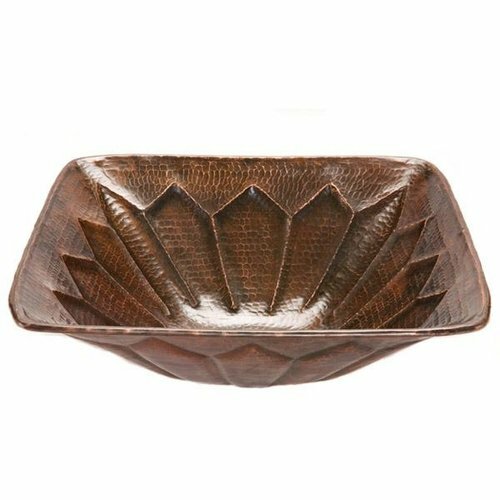 All of our copper sinks are made from the lower gauge, thicker copper. 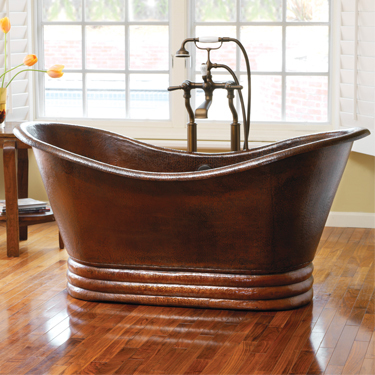 Copper tubs bring back memories of a bygone era. Remember the old TV Westerns where the cowboys went to the bath house and bathed in a large copper tub after a long cattle drive? Maybe your grandmother had a copper tub. 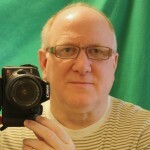 Van Dykes carries a great selection of slipper and double slipper styles as well as a Japanese Style Soaking model. Just add a freestanding bath filler or wall mounted faucet for a unique bathroom ensemble of your own. 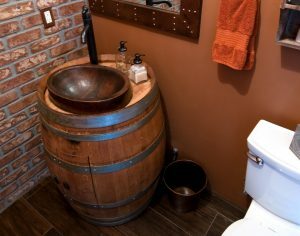 Our new Whiskey Barrel Vanity and Sinks from Premier Copper feature a French wine barrel vanity that has been upcycled from a winery in Napa California. These barrels are used wine barrels that have been completely disassembled, cleaned and then reassembled. This barrel has been upcycled into a piece of furniture and will not fall apart and distort over time like other barrels on the market. They come in a number of sizes and package options and add a unique look to any bathroom. An informative installation video highlights the features of this great vanity and sink.